A short story of a young teen trying to make it right, from killing his younger brother...a...rite of passage. Are you looking for an ebook that won't take you days to read? How about a short story or if you're bored, while stuck in traffic and would like to listen to a great story. Oh, I would like to give one side effect that I noticed when some mothers with kids that have read my story... loving tears. If you're interested, my story is listed at Amazon.com. 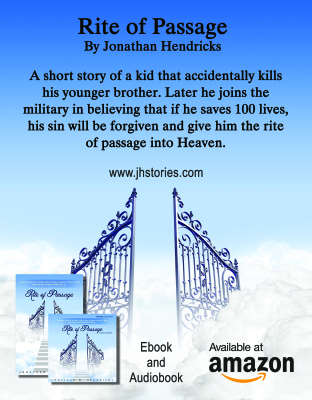 Just type "Rite of Passage, Jonathan Hendricks" inside the search bar. Another option is just click on the left image or buy button and it will redirect you to my book listing at Amazon.com. Take a peek inside my story and check out the reviews that I already have. And if you decide to give my story a shot and if you like it, please spread the word. Thank you. E-book also available at book country.